We just caught wind of another great contest, This one from Yamaha Canada. Yamaha is giving away a brand new SCR950 and all you have to do is sign up! In case you don’t spend as much time as I do going to dealer shows and reading every possible piece of Moto news, the SCR950 is the latest iteration of the popular Bolt lineup. Last year Yamaha jumped into the scrambler market following the success of scramblers from Ducati and Triumph. I haven’t had the chance to ride one of these yet but as an owner of a Yamaha Bolt R-Spec I can tell you this is a very capable motorcycle. The SCR950 shares the familiar 942cc air cooled V-twin, which pumps out surprisingly good torque and smooth power through all five gears. A slightly redesigned frame and seat give the SCR a comfortable upright seating position. This coupled with the knobby tires, up-swept exhaust, Moto style handlebars and a vintage style number plate give the SCR950 the vintage look that would impress even the most discerning hipster in Liberty Villiage. 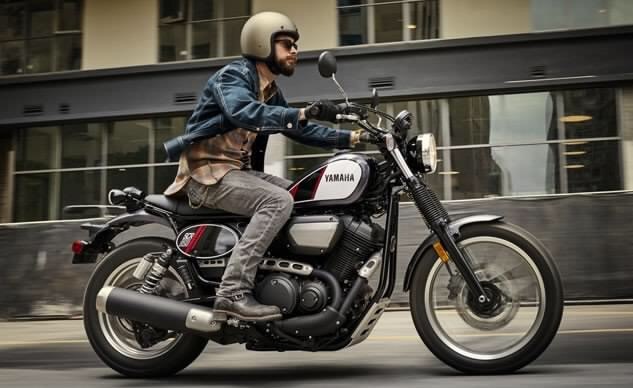 Yamaha describes the original Bolt as an “urban performance Bobber” and I would say this holds true to the SCR950 being an urban performance scrambler. Probably more suited to tearing up city streets and two lane highways in search of the newest craft IPA, than navigating single track. Although the raised suspension and knobby tires opens up a world of gravel roads to explore and who doesn’t like the idea of exploring new roads and the ability to slide around corners like a motocross racer! I for one am looking forward to getting my hands on one of these this spring and who doesn’t want a chance to win a motorcycle. This entry was posted in Motorcycle by emew24ca. Bookmark the permalink. I must win that bike. You and me both! Good luck!